The current “cruiser” platform is built around the laterally-mounted V-twin motor (originally 700cc, now 1100), running through an in-line, automobile-type transmission straight through to a drive shaft and bevel-drive final. After more than 40 years, it’s a highly refined system. The motor could best be described as a “two cylinder small-block, American V-8”. This really isn’t a stretch. The cam is in the vee, there is a conventional sump, it has a hemi-head with pushrods and rockers. It also makes gobs and gobs of torque, is insanely easy to work on, and is dead-nuts reliable. The California Vintage is a celebration of this linage, from the first V-twins, through the Police Bike era and up through today. The first California appeared on the Eldorado platform, all white-pin-striped black with a white-trimmed “buddy seat”. Moto Guzzi was selling more bikes in the United States than anyone had ever expected, thanks to the adoption of many police organizations, including most in California and Arizona. The combination of “if it’s good enough for the Cops it’s good enough for me” and the big 850 motor made the Guzzi a very popular choice, as hundreds of current owners of these “loop frame” bikes will attest. Guzzis build cruisers, and they have built them for a long, long time. This is no late-comer, me-too, bandwagon cruiser, built to exploit a market niche that came about from Harley-Davidson’s renaissance. These guys built cruisers because they wanted to, and have toughed it out for years when companies with better resources and larger dealer networks have walked all over them. The thing is, they never gave up, they never stopped building the platform, and they stayed true to their mission. So what did Moto Guzzi do with this (arguments start here) most popular platform cruiser bike ever to come from Europe? The second-oldest continuously built cruiser platform in existence? The refinements are many. Brakes are sport bike standard Double Brembos in the front and a single in the rear on the California Vintage. The 1094cc engine has a smooth, stumble-free injection system. The exhaust coming out the back meets the tough Euro-3 standards, and the standard bags are best-of-breed huge and integrated perfectly into the design. The seat is updated and integrated into the design. The windscreen has been tested to assure smooth flow around the rider, and the suspension has been upgraded with another sport bike goodie — Marzocchi hydraulic telescopic fork with rebound and compression adjustability. The rear suspension is ubiquitous twin shock, with preload and compression adjustability. The Guzzi sound is still there. It sounds like no other v-twin engine, and I have to believe that the Guzzi Engineers wanted it that way, unlike their more “me-too” cruiser late-comers. It’s kind of V-Twin, but more “small block”. Brings smiles by the bag load, and you don’t get into that “Harley patented their sound” conversation. Unique is good. They kept the look. It looks like a Guzzi, a real, honest-to-goodness, Magnum Force police bike. They kept the handling. The Cal weighs in at about 560lbs, so it’s light and it really shows when the turns start to increase in frequency and wavelength. It’s still a torque monster, with a choice of three gears at any “happy speed”. It didn’t give in to the drag-racing-slick-rear-tire look. It’s still a Guzzi, and that means it’s not a Harley, Harley-clone, Harley-wannabe, Harley anything. It’s the anti-Harley in the cruiser market. It’s the non-wannabe. The combination of suspension, brakes, handling and balance make this a bike for a non-cruiser-cruiser-buyer. Guzzi didn’t give in to fads, it stuck to its principles. No fat tires that affect turn-in. No huge cubic-inch motors, because without the excesses of fat tires, weight and design compromises for looks, it just wasn’t needed. The Goose will definitely go “fast enough”. If you want to do 160, this isn’t your bike. If you want to ride a bike a lot, anywhere, anytime, in a comfortable riding position that doesn’t require a kidney belt and three bottles of Advil for your sore arms and buffeted neck, this is your bike. I approached Piaggio about running this test months ago, and we’ve both finally had the time to do it. I explained that I’d like to do a longer test, more than a couple of days, and blog about it. I told them that I was mystified why the Mandello de Lario-based company didn’t sell more of these bike than they could make, since the $15,000 price point, great looks and performance are a bargain. I picked up the California Vintage from Piaggio’s yard on a bright Friday morning. My goal for this test is to give my impressions of the big Guzzi over a week’s period of riding. I ride a lot. My commute to my real job is 160 miles round trip, so this bike is going to get a workout. I also want to ride it to some of my regular get-togethers to gather impressions from other cruiser owners. I also want to expose the Cal to other riders that are on different mounts, those riders that are buyers. I can’t get off this bike long enough to write about it! My first day on the bike covered nearly 300 miles and my suspicions were solidified. I’ve been riding for four days and have finally gotten off long enough to start writing. It’s 5am in the morning, and I’m going to get back on soon. I’ve put more than 600 miles so far and have some great opinions, beginning with my impressions of the day-to-day commute, but that’s for tomorrow’s entry! Good stuff. I’m wanting to sell all my old Guzzi stuff, (except the V700) and put a down payment on one. I need to find a rich old lady to service, who will let me quit my job and supply me with money and gas for long, long trips. Actually, I can verify that Piaggio has renewed dedication to getting parts. I dropped the Breva 1200 Sport that I had been testing and had to order a turn signal, rear brake lever and engine rub guard — I was scared as hell because I had heard the horror stories and the dealer hadn’t stocked the parts, and this dealer is #3 in the US. They were in my hands in two business days. I think the times are changing with regards to this. Great article. Looking forward to the updates. Thanks. I have an ’03 Cali Titanium that I love. It offers all that I need. “Model-spec’s” aside I believe they are philosophically the same – engine, frame, brakes. Put ~14k miles on it the first year. Surprised my brother (the HD-guy) by showing up to a family party on ‘Ti’ (~625 ride – one way). I don’t know if I want Guzzi to succeed here any more than they have. I kinda like the marque being ‘unique’. Kinda like being confused with the old water cooled Honda’s by the casual passers-by. Working on getting a pic. Dunno if it takes away from the police look all that much — When I was a little kid, Floyd Fink and his partner ran All White Arizona Highway Patrol Moto Guzzi Ambassadors through my home town of Miami, Arizona. I think I want the white for that reason. I’ll take the red and white one, thanks. Proven durability. Known good performance. There are many white police bikes. The Phoenix PD used white Guzzis when I was there from ’73 thru ’77. I was enamored with them. BTW I love my California Vintage even though it’s black. “I’ll take the red and white one, thanks. The red and white one is the absolute bomb to ride, I’ve put 12k miles on it with only a few easy maintenance/repair issues. That said, the brakes, well, you need to make reservations to stop with them! The Vintage is proving to be the Eldorado with more horsepower and better brakes. Eldo always had great handling, and the Cal is just putting a grin on my face every day. I’m with the old Eldorado. Owned quite a few of them. Also owned a Bassa among other Guzzis. The Eldorado LAPD with Disc brakes is a grin maker and then some.Plenty of power for me and the brakes are just fine. The Eldos have a lot of quality built in. Service them yourself too. I did some adjustments on the Cal, and any Eldo owner would be completely at home, except they wouldn’t have to fuss with the carbs or points anymore, and the battery is accessed nicely. Also, no more broken cables, no more brake adjustments. You get the big Police kickstand for free, along with 300 more ccs and a very sweet exhaust that you’ll not have to worry about sourcing parts for. The engine webbing’s the same, the trans shifts like it always does, and I think a little tinkering will get that baby to shift like a real Guzzi (reverse-style) in no time. You can be with the Eldo, I mean, I’d never sell mine, but frankly, I’m convinced that the Cal is more Eldo than later Tonti bikes. 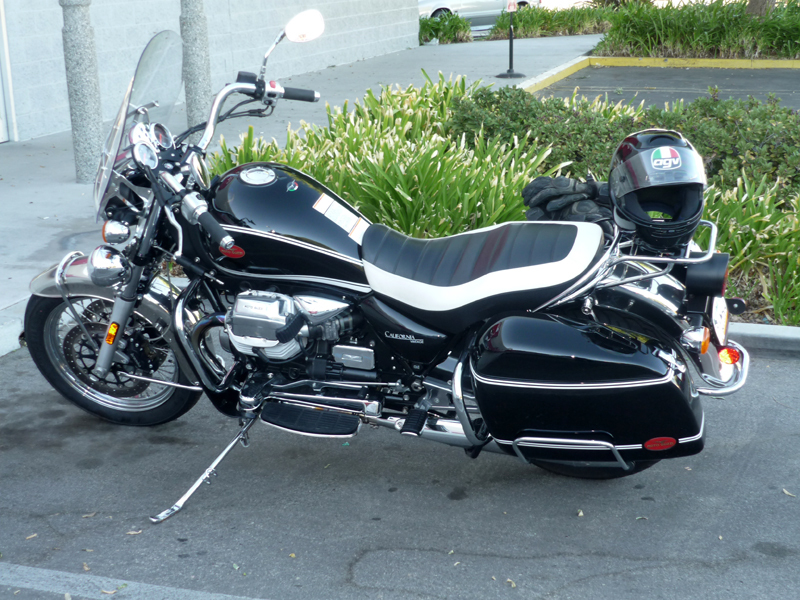 According to Greg Fields book “Moto Guzzi Big Twins”, the original California series started with a 750 motor in 1971. That would mean the first Cali was the Ambassador. The California series captures in a way the quintessence of motorcycles. A pity I’m too tall for one (mostly legs too long – knees stick out above the tank, ready to get butted by the handlebars should they lock). I just can’t help to feel that Guzzi went somewhat over the top with the Vintage. Tubed tyres are not just vintage, they’re … somewhat obsolete. That taillight … a fugly tube of thick rubbery plastic – why not the nice Jackal’s double taillight, or the the single oval found on the California? I think that one of the things that you get for your money on the Cal is the fabulous fuel injection. Guzzi really got it right when compared to the earlier injection systems that they used. No flat spots, no issues at all. Some people are going to be too big for this bike. I’m blessed with an “italianate” body. Long torso, short inseam (I’m 6’1 with 32 in inseam). I’m absolutely perfect for the bike. I have a Norge, which is a perfect compromise (that also keeps my knees warm in winter 😉 ). I just fit, and can really flat-foot her. If I’d had to choose now, I might go for the Stelvio, but I’m not impressed with the so much smaller fuel tank! The Vintage, Classic and Touring (current models) all share the same engine, no? Or is the Vintage back to the “pre-PI” engine without the hydraulic whatever-it-was? I love the Vintage tail light, though beware that the bracket is quite fragile due to all the holes drilled near the bend. I’ve added a gusset to keep this from breaking again. 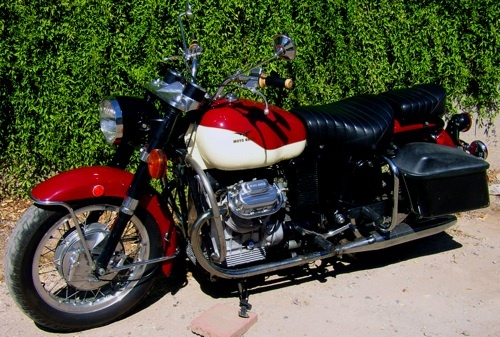 I own a 1974 Moto Guzzi California. When I purchased it I was so amazed with the condition it was in. I love the nostalgia of the bike and want to maintain that as much as possible. Unfortunately the left saddle bag cover flew off because of my lack of riding experience (I forgot to secure it after I put my purse in it). We were able to retrieve the cover but it had been run over. Anyhow, I would like to make it good again. If anyone has a cover, that would be great. Otherwise I will have to have my friend try to fabricate due to my lack of experience. Thanks to any that can be of help. I would try Moto Guzzi Classics in Long Beach (http://www.motoguzziclassics.com), MGCycle ( http://www.mgcycle.com ), or Harper’s Moto Guzzi (http://www.harpermotoguzzi.com/). To start with. I would also join the loopframe_guzzi group on Yahoo groups, because the 400+ members there know where just about everything is. There is also an excellent forum at wildguzzi.com — You should be able to get what you need quickly and painlessly. Oh, and I’ve trashed a lid on a bag doing the same thing you did. Epoxy a cable from the bag to the lid on the inside front. Depending upon the bags that you have, you might have to replace both of them, and there are tons of them out there. Good luck. Nice review. Moto Guzzi is, while other brands are just pretty good. Guzzi is sort of like the Dracula thing, once bitten your hooked for life. Just read this review and it’s rings so true! I have a 95 Cali. I got it with 18000 miles four years ago and just turned 42000! Never been in the engine or transmission, only general maintenance. I love this bike! I frequently put in 2-3 even 400 Mile days on this bike and get up and do it again the next day! (do that on a HD) Any true biker knows what he’s looking at and always get great comments on it. Its a rare unique bike that I’ll keep as long as I’m riding! just bought one.hope its everything i hoped for.will let know. Previous Previous post: Moto Guzzi Breva 1200 Sport — 1000 plus miles, back to the factory!